Here is one common problem many early adapters of Samsung Galaxy S4 complained about; the Smart Stay feature ain't that smart. One of Samsung Galaxy S4's core features known as Smart Stay does not stay at all. The screen goes dim and the phone timeouts even if the user didn't turn away his/her eyes from the phone. There could be a lot of reasons why this problem occurs but in order to troubleshoot this issue properly, the owner should check a few things to make sure the phone is in the right condition to perform the Smart Stay task. 2. The phone must face the user directly. 3. The user must be in an environment with sufficient lighting so the eyes can be recognized better by the phone. 4. The user must not be wearing glasses. 5. The front-facing camera should be working properly for the Smart Stay feature to work perfectly. Now, here are some of our recommendations to learn the underlying cause of the problem and hopefully solve it. 1. Pull down the notification panel. 2. Expand the toggle keys by tapping the icon on the upper right next to Settings icon. 3. Tap on Smart Stay to turn it on. 4. If you've already turned it on, tapping on it once would disable it so you'd have to tap on the icon again to enable it back. At least, you are now sure the feature was enabled on your phone. 1. Turn the phone on (and take your glasses off). 2. Hold the phone at about two feet away from your face with its screen facing you. 3. Wait for 15 seconds (assuming you set your screen timeout as long as that) to see if the screen dims and turns itself off. If it continues to stay up, Smart Stay is just working fine. 4. Otherwise, go to a well-lit place and test the feature again. If it's still not working, then there's a problem with it. 1. Reboot. Try to see if a simple reboot would solve the problem as it would bring the phone back to its working state. 2. Clear TouchWiz Data. 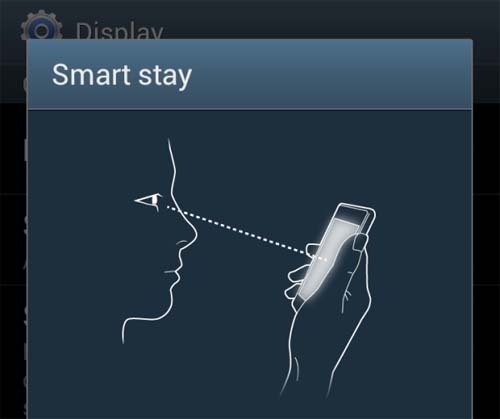 If the Smart Stay feature was working before and it was only recently it stopped detecting your eyes then it is apparent there's a little problem with the software that runs it. Clearing TouchWiz data may solve this problem but users must take not that doing this will clear all personalization or customizations they've done to TouchWiz. 3. Make sure the front camera is not used by any application. Recall which application used the front camera and close it. You can press and hold the Home button while in the home screen to see the list of recently used apps and close each one of them. 2. Factory Reset. It might just be the problem with TouchWiz, it could also be a hardware issue, or both. Doing a factory reset would ensure things will be reset back to their original (or optimal) settings. Users, however, should backup all their data as this procedure would all delete them. 3. Have a tech look at it. After doing the procedures above and the problem persists, it's time you have an appointment with a technician so the device would be checked further. But then comes the hassle of waiting, possibly for a few days, until the real problem would be diagnosed. If the phone has a defect beyond repair, a replacement unit may be provided. Tell us about them by sending us emails at sebertech@gmail.com. We will run stories that may help fix those problems. Please be detailed as much as possible and we do appreciate you include in your email your phone's model and other necessary information that may be helpful in diagnosing what the real problem is. The user must not be wearing glasses? What kind of half-assed technology is Android pushing here?